As the muslin had be adjusted in all the sections, except the collar so much from the original pattern I had to make all the patterns for the facings & linings from the second muslin. Although the muslin pieces could have been used as a pattern for the silk organza underlining and hair canvas interfacing I decided to make new pattern pieces from tracing paper. The collar pieces and cuff interfacing I did not make a pattern for as they were unchanged from the original. 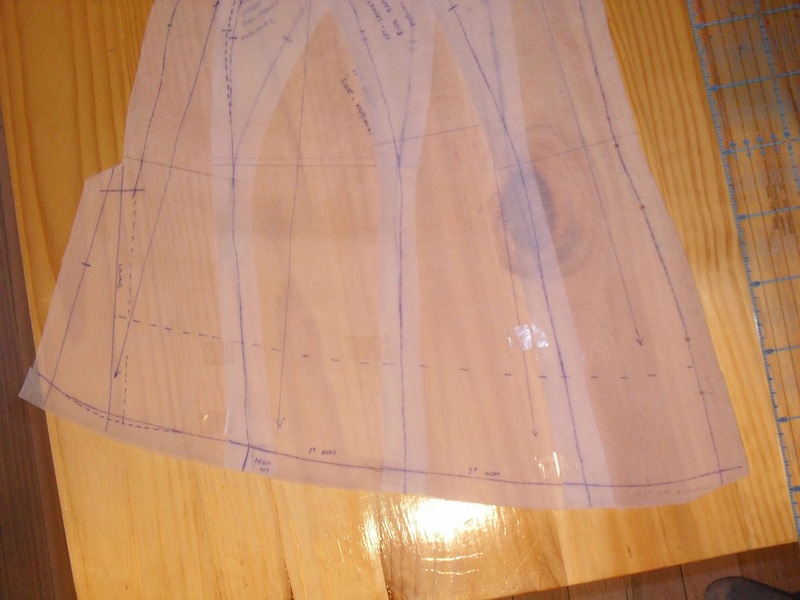 The most complex pattern pieces I needed to draft were the hem interfacing (shown below) and the front facing. The hem interfacing was drafted by joining the back, sideback, side and side front together at the hemline lining up the stitching lines and then measuring up 4 inches from the hemline to form a strip that would fit along the hemline. The front facing was challenging as the front piece contains a dart under the lapel, but the front facing did not, so I needed to trace some of the front pattern then shift it to account for the dart to trace the neckline and shoulder seam.